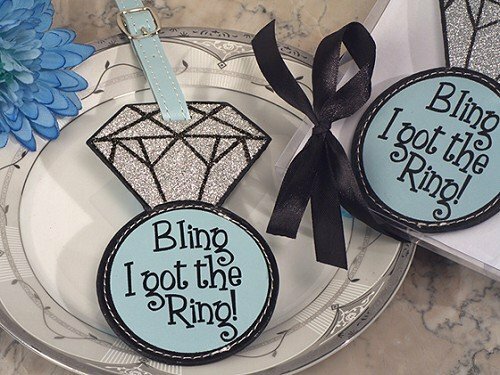 Bling Bling I got the ring Travel in style with our shimmering diamond ring shaped luggage tag , each blue leather tag is highlighted with words Bling I got the ring . Every time your guests take off for their next destination they will be reminded of this thoughtful gift. Our luggage tags are useful as well as practical favors that your guests are sure to appreciate. Each favor measures 3 inches x 2 inches and comes with a matching strap to hang onto your luggage. Each Cassiani Collection exclusive favor comes in a clear pvc gift box and finished with a black satin ribbon bow ready for presentation to your guests.